Who ate all the Pis? I want a Raspberry Pi. I must have a Raspberry Pi. My home PC is drab. My Mac Mini is dusty. My iPad, which in my case I have not got, is a fatuous slab of plastic. Let me see the glimmer of the surface-mounted LED, and smell the green, green circuit board of 'Made in China'. But a Raspberry Pi is an example of that species of good that it is not satisfactory to acquire directly. It is like tickling: it is a thing that must be given, or the magic will not work. Therefore C must buy me one. Me, fiddling with Plex: Fancy a TED Talk for a change? C: Sure... just as long as the lecturer isn't called 'Eben'. I hear that there is a delay on delivery at RS, presumably caused by a shortage of stock. Raising the question: who ate all the Pis? At work, one of our wretched NAS boxes stumbles in its disk sharing. Dr Google opines that a tweak to its Samba config will fix this. Oh well, it is a chance to practise my ssh-ing. To 'ssh' is not the act of hushing somebody; rather it is much the same as telnet , except you have to download PuTTY to do it. PuTTY obtained from charming, ancient website which reassures: 'I believe it is legal to use PuTTY, PSCP, PSFTP and Plink in England and Wales'. Users in Scotland presumably have their own program. Anyway, after a few minutes all the old Unix skills come flooding back: typing backslashes in paths that demand forward slashes; neglecting to type sudo when I must type sudo; getting hideously stuck inside vi, unable to recall the correct exit keystrokes, and so trampling all over the edit I have just made. This is exactly the kind of thing we need to be teaching the kids. 'Here you are - just as you asked.' Smallish package, good, reused chocolate box, less good. Inside: some sort of pallid homemade pastry, with pinkish fruit adhered to the top of it. WTF? A mince tart suffering from gastroenteritis of the filling? It's only when they all start laughing that I understand. Oh, ha ha. Of course, there will be a real Raspberry Pi coming along in a minute. There had better be. Gah. Will have to think about this. Non-instant gratification. Would it be possible to set the whole thing up headless, just using ssh? Feels like a tall order for someone who exits the vi editor with the grace of a fly exiting a room through a three-quarters closed window pane. Had journeyed to a Maplins to sink an outrageous one-and-twenty quids on a DVI to HDMI Adaptor when I remember that I have a spare one somewhere from the Mac Mini box. Flushed with success at this recollection, I blow various sums on a pair of PC speakers, a User Guide co-authored by Eben Himself, a massive 8GB memory card and a beautiful Pibow case. Big decision time: which OS? webOS Dear old Palm Pre, the fun times we had together. You scratch my back, I'll scratch your screen. Has no UI, according to the article. You what? webOS without a UI? Reminds me of when Billy Connolly boasted 'They brew it like real lager... then they take all the alcohol out'. Back to school tomorrow. Time to review state of my various holiday projects. Learn Erlang properly - flunked. Learn Haskell sufficiently so as not to be intimidated by the word 'monad' - flunked. This will suffice to get me through Borgen, no trouble. Assemble and prepare my RaspPi. Triumph. My Pi boasts absolutely up-to-date firmware, and I have also installed the Chromium web browser and a VNC server. (Didn't bother with Java, as I don't need the Ask toolbar.) The geek boys at work can hardly fail to be impressed by this. 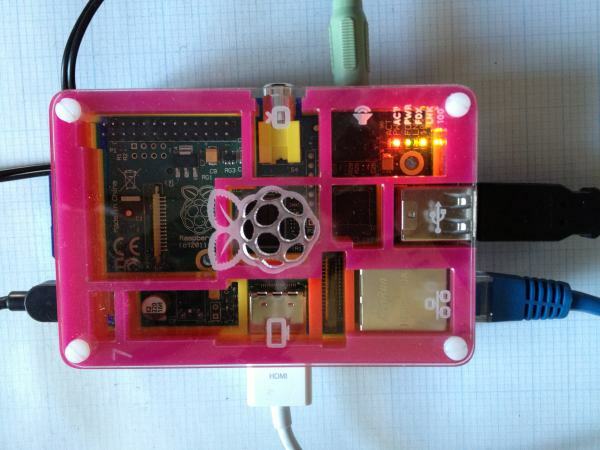 Complete a project using the Pi. Flunk. I did contemplate a small Python program from my book entitled 'flashing an LED', but was discouraged by the recollection that the string of fairy lights I have just taken down contains 60 multi-coloured LEDs, which are cycled through a repertoire of about three dozen flashing patterns, two of which make the dog howl. Hopes of spectacular individualism dashed. Everybody at work got a RaspPi for Christmas except the managing director. He got a Macintosh Airbook. I am also put to shame by the applications. The marketing guy is using his as a home theatre PC, and can now summon to his iPad, at the swipe of a digit, any episode from any season of The Killing, The Bridge, Borgen or - a bit non-conformist this - Spiral. He runs all of them with subtitles off. The project manager, meanwhile - and this is a man who is known to have struggled for some minutes to find the main menu in the new FireFox - has written a Python program that interrogates his diary in Google Calendar and switches on the central heating in his holiday cottage in Wales so that everything is nice and toasty when he arrives for the weekend. Not only am I revealed as being totally without imagination, the price of peripherals seems to have gone through the ceiling. I can't afford a holiday cottage in Wales. Greet the Hungarian cleaning lady warmly as befits the new year, but flee before she can initiate her usual conversation about the wonderful deeds of her clever son. On current form, he has probably adapted his RaspPi to do the air traffic control over Budapest. Find a blog of RaspPi enthusiast who is worried about the lack of proper unit testing. It probably reflects unflatteringly on my chronically undisciplined approach to my craft, but this feels a bit like flying to Mars and then worrying about the absence of properly enforced car parking restrictions in the landing crater. It has snowed. I have an idea for a project, requiring a camera (to measure light reflected from the ground), a thermocouple (to measure ground temperature), a microphone (to pick up idle banter in the office) and a secure network account (to access the bank accounts of my colleagues). During snowy weather, every time somebody says 'I am going outside, I may be some time' it will automatically dock them £10. How about this: what if I write my Reg column on the Pi? That would be a proper project, and I'm pretty sure nobody has done it before. Yes, I like this idea. Working headline: 'Out of the raspberry came forth laughter', something classy like that. One thing, though - LibreOffice bound to run like a dog. Really don't fancy doing it in vi for obvious reasons. Of course, there is nothing to stop me doing it in Word as usual, bung in a few extra grammatical errors and claiming that I had written it on the Pi.